Summary: If you’re looking for a great instrument wireless system that is both easy-to-use and a snap to set up, look no further! Pros: 1680 available frequencies make this ideal for busy RF venues. Super easy to set up sensitivity levels. Transmitter sports a metal housing, so durability shouldn’t be an issue. Integrated guitar tuner in transmitter – works great! 25Hz low-end response – great for bass! Tone Bone Score: 5.0 ~ I waited a LONG TIME to pull the trigger on a wireless system, and while I could’ve gotten a cheaper one that would work well, but it was hard to argue with the frequency coverage of this unit. The added features of a guitar tuner and EQ are great, but the ease of use factor really hit home with me as well. As I mentioned above, I’ve been holding out a long time to get an instrument wireless system. When I finally pulled the trigger, I decided upon the Sennheiser G3 Wireless system; first and foremost because of the number of frequencies it has on tap, but honestly, also because it’s a name I trust as my performance mics are Sennheiser. I’m not being a cork-sniffer here. I swear by the brand because of the years of great performance I’ve gotten out of other Sennheiser equipment, so it stands to reason to trust it for something completely new. As it turns out, true to my past experience with Sennheiser gear, there was absolutely nothing to be disappointed about with the wireless system. I took it to my church gig yesterday and it well, just worked, with no tweaking on my part; save for adjusting the sensitivity levels which I didn’t even think to do when I first opened up the box. In fact, I didn’t even read the manual when I took it out to try in my studio. I just attached the antennas to the receiver and plugged in the instrument wire into the transmitter, popped in the batteries, and let ‘er rip. It literally took less than a couple of minutes to get up and running. Insofar as my church gig is concerned, it was a great venue to put the unit through its paces, as there are potentially several wireless units in operation at one time, including my own wireless headset mic. I’ll talk more about the system’s operation below. In any case, since this isn’t something that actually makes music, my review areas are going to be a bit different from my normal reviews. As I indicated above, the unit’s pretty plug and play. But of course, you should check the sensitivity of the transmitter and receiver to make sure you’re not overdriving the unit. The LCD’s on both the transmitter and receiver makes setting sensitivity of either unit a snap. Both have an active meter and navigating to the sensitivity menu is just a couple of button presses. Sennheiser did a great job with the menus to make them only two levels deep, so you won’t have a problem getting to the parameter you need to set. Both transmitter and receiver have very sturdy metal housings, so you needn’t worry about the units cracking. 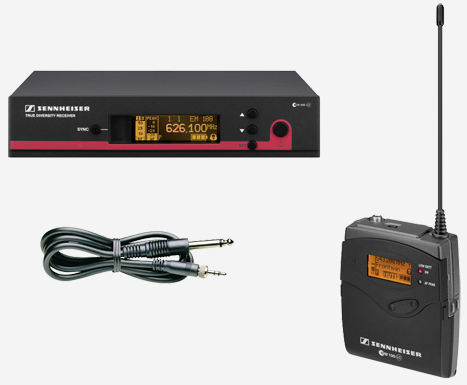 The transmitter has a real solid feel, and that instills confidence that you don’t have baby the unit, though of course, it’s always good to take care of gear. Despite having 1680 UHF frequencies to scan, the receiver locks on to a usable frequency almost instantaneously once you turn it on. That is such a boon to using the unit. You switch it on, and you can use the unit. One of the tests that my sound guy and I did was for me to walk a distance away from the receiver to see if it lost connection. I honestly don’t know what the maximum range is, but no matter how far I got away – I got about 100 feet away – the transmitter and receiver didn’t lose their connection to each other. To save battery life, when I’m not playing I always switch off the transmitter on my headset mic. I did the same with the G3 in between songs. Every time I switched it back on, making a connection to the receiver only took a couple of seconds. I haven’t even begun to explore all the different features that this system has; one of which is a cable emulation mode that simulates a cable’s capacitance to ensure consistent operation of your effects and amp settings whether you’re plugged in or wireless. This a great feature. Admittedly, I didn’t use this, but my rig sounded pretty much the same with the same dynamics once I dialed in the sensitivity of both transmitter and receiver. Or it could be that the only thing I obsess about with my tone is if it sounds good and I’ve got dynamics. Minute changes due to changes in my chain don’t really bother me too much. So if I got a slight change in tone, since my sound with the G3 system was good with no loss in dynamics, it didn’t trigger anything displeasing with me. But other than performance and sound and all the other stuff I discussed, going wireless is simply fantastic. I like to move around a lot when I perform, and not being tied to a spot by a cable is so freeing! It really boosted my ability to lead musical worship, and that is so COOL!